← Are You Making a Difference? Well, people have been talking, that’s for sure. Especially here in Kansas City. Monday, KC recorded a record high for January of 74 degrees. It was over 60 when I woke up Tuesday AM. By lunch time it was 48 and dropping. And this morning snow flakes are falling! It reminds of when we first moved to the area, Don Nolte said, “If you don’t like the weather here, just wait a little while and it will change.” Actually, I’ve been told that everywhere I’ve ever lived! Weather patterns change. Fronts are stalled. Temperatures rise and fall. And there is not much I can do about the changes, Al Gore and the global warming theorists notwithstanding! Yet change is inevitable. Life is full of changes. Circumstances change. Culture changes. Styles change. Laws change. And the weather changes! Some changes are good. Others are bad. But we must accept change. Live with it. Deal with it. Adapt to it. Ironically, the very people who should embrace change often resist it. And that’s Christians! Maybe it’s because we confuse Truth with tradition. Christ with custom. Human methods with the Divine Message. Obviously God’s Word doesn’t change. And we should remain true to unchanging principles of righteousness and godliness. But consider this. 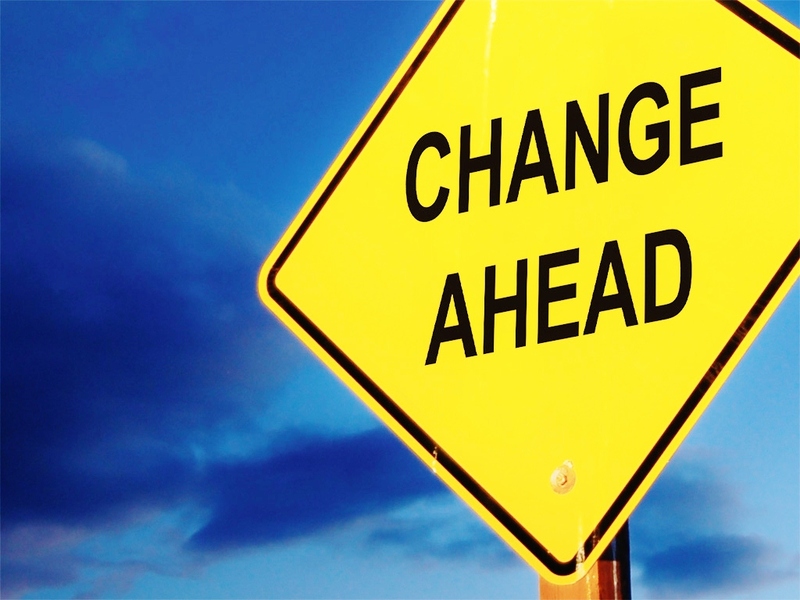 Christian growth requires change. We are commanded to “Grow in grace and in knowledge” (2 Pet. 3:18). When we became Christians there was a change in relationship–from serving Satan to serving the Lord (Rom 6:17-18). Our thinking should be changed to emulate the attitude of Jesus (Phil. 2:5). God expects a change in our lifestyle (Eph. 4:22-24). Author and lecturer Gail Sheehy once said, “If we don’t change, we don’t grow. If we don’t grow we are not really living.” Jesus came that we might enjoy an abundant life. A full life. A complete life. In Him. Failure to grow and change will result in a life that is stagnant. Static. And unfulfilling. No Christian can grow and stay the same. Neither can a church. People that grow make changes. Modify methods. Alter approaches. A business that never changes will eventually go out of business. A sports team that doesn’t change, will find themselves at the bottom of the league standings. A church that won’t change will be staring at a lot of empty pews. Do you want to grow? To be a stronger Christian? A more devoted wife? A more loving husband? A healthier church? The answer is found in one word. Change. You can’t change the weather. And you may not change other people. But you can change you! I believe that the Bible is devinely inspired by God, but with a big caveat. NT & OT writings were made over 2K to maybe 10K years ago to communicate into a culture much different than today and in the future. Of course in dealing with man’s heart, the Bible is timeless. But what about some culture issues? Clearly in more recent times, the issue of the institution of slavery is a prime example, which divided Christ’s Church (between the “Liberal” North and Europe & the “Conservative” South). What should be our spiritual approach to changes such as the role of women (especially in the Church), things that we are understanding in science (from the Book of Knowledge), etc? Education levels of women and how they are viewed in society are much different than the time of Paul. We have science tools like radio-metric dating and brillant scientists (like Einstein) that didn’t exist thousands of years ago. Increasingly, I am “balking” at “literal interpretations of the Bible”, typically made by social conservatives. Can you write a Biblical perspective to this conundrum? (not glossing over the fact that for hundreds of years, conservative Christians in the South were on the wrong side of the institution of slavery issue). As a Christian, I have found no biblical instruction nor precept to be out of date. One can be a New Testament Christian in the 21st century perhaps more easily than in the first century. I would suggest that the world now views slavery as a bad thing in most cultures. Personally, I believe that change is due to the biblical teaching having to do with loving your fellow man. While it is true that the world and society changes dynamically, technologically and culturally, following the teachings of the New Testament is as simple today as it was 2000 years ago. Christianity has to do with the heart, regardless of your place of birth, your culture, the century in which you live, or the country in which you live. Regardless of your station in life, your chosen profession (though some professions are contrary to Christianity and your heart might demand that you change your line of work), you can follow Christ as simply as those of the first century AD followed Him. I can say without pause and without reservation, being a Christian has enriched my life beyond my own comprehension. I cannot measure the goodness and grace of my Lord Jesus. We are on our way somewhere wonderful! Sent from my iPhone: BLESSINGS!